(Newser) – An appellate court has upheld the conviction and 20-year sentence of a white former South Carolina policeman for the shooting death of an unarmed black motorist who was running from a traffic stop. The 4th US Circuit Court of Appeals made that determination Tuesday in the case of Michael Slager, writing that a judge "committed no reversible error" in sentencing Slager in 2017, the AP reports. Attorneys for the former North Charleston police officer said they planned to ask the court to reconsider. 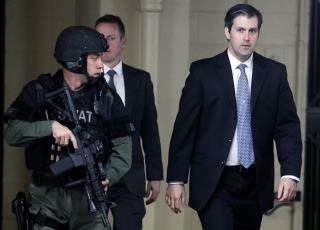 US District Judge David Norton sentenced Slager after the ex-officer pleaded guilty to a civil rights violation in the 2015 shooting death of Walter Scott, who ran from Slager after a traffic stop. Slager is one of only a few police officers to go to prison for a fatal shooting, and his sentence was the stiffest since the shootings came under scrutiny in recent years. The case became a rallying cry for the Black Lives Matter movement. As part of a plea agreement when Slager pleaded guilty in federal court to violating Scott's civil rights, prosecutors agreed to drop state murder charges that still lingered after a first state proceeding ended in a mistrial when a jury couldn't agree whether he had committed a crime. Kristen Clarke, president of the Lawyers' Committee for Civil Rights Under Law, said Tuesday that while the decision won't bring Scott back, "it provides some small measure of justice for communities and families that are too often impacted by the tragic and fatal shootings of unarmed African Americans." Isn't this the cop that shot the guy in the back as he was running away, and then planted a gun next to him, not realizing someone was recording all of this on their phone? This case was worth the marches. If BLM stuck to this as their plaltform and not "hands up don't shoot" they would probably have even more support. Glad he's going to spend a lot of time in prison. "state proceeding ended in a mistrial when a jury couldn't agree whether he had committed a crime" This is due to the brainwashing by the government, that starts in grade school, to fool us into believing all cops are good guys. This guy murdered someone in cold blood, cut and dry case.